[ACT](VC) Limit Break 4 (This ability is active if you have four or more damage):[Counter Blast (2)] Until end of turn, this unit gets [Power]+3000 and "[AUTO](VC):When this unit's attack hits a vanguard, if it is the fourth battle of that turn or more, retire all of your opponent's rear-guards.". [AUTO](VC):When this unit attacks a vanguard, this unit gets [Power]+3000 until end of that battle. [ACT](VC) Limit Break 4 (This ability is active if you have four or more damage):[Counter Blast (2)] Until end of turn, this unit gets [Power]+3000 and "[AUTO](VC):When this unit's attack hits a vanguard, if it is the fourth battle of that turn or more, retire all of your opponent's rear-guards.". Personally, I always saw Hydro as the middle sibling between the 3 Tear Dragons (Maelstrom and Navalgazer). While Maelstrom focuses on gaining a nice card advantage with his Limit Break and Navalgazer granting extra attacks, Hydro just wants to do pure, global saturation...I mean destruction...Similar to Navalgazer, Hydro's Limit Break is a Counterblast 2 and it grants you an extra 3,000 power boost, but that's where the similarities end. If Hydro hits the Vanguard when he used his Limit Break and it's the 4th attack or higher, then he nukes your opponent's field! If this effect hits, then your opponent is either forced to call out just about everything in their hand to make up for the lost units or is stuck with having only their Vanguard on the field. Either way, this card will force a lot of cards from your opponent's hand whether it hits or not. One thing that also should be noted is his other skill. At anytime that this Vanguard unit attacks a Vanguard, regardless of which attack it is, he automatically gains +3000 power which is enough for him to go neck and neck against Crossrides. With all of this said, there is one glaring drawback that Maelstrom will always beat Hydro on, and that's the fact that Hydro is only 10,000 power. These days, Vanguards who aren't 11,000 power or higher will get bullied really easy against Loyalty Columns (8,000 booster with a Burning Horn, Daidragon, Bedivere, etc.). Aside from the fact that most players will try their best to block this and the 10,000 power, this is a card that people shouldn't be sleeping on; it's definitely a nice substitute if you are shy on Maelstroms! Hydro Hurricane Dragon, similarly to yesterday’s card, has a limit break that is active upon the fourth attack of the turn. Like Maelstrom, Hurricane requires a storm rider rear guard to rack up the number of attacks before attacking himself. In order to do this limit break, you must counterblast two in the main phase first, and then if he hits the vanguard on the fourth attack, you can retire all of your opponent’s rear guards. When you activate, he gains 3k, and then when he attacks, he gains another 3k for a total of 16k unboosted. This is the same range as Maelstrom, so you can hit similar numbers, but the disadvantage is that you have to activate the limit break in the main phase. The opponent will see it coming, and change their guarding strategy. This isn’t to say it is a bad limit break. Far from it. If they don’t have the cards to guard, the opponent will take massive losses. The threat of losing a single rear guard versus losing them ALL is what makes Hurricane often more of a threat than Mealstrom can be. 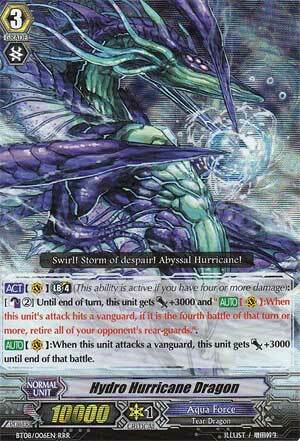 Hurricane is an overlooked card in the shadow of Maelstrom, but is more than able to hold his own. Expect to see him popping up more and more. Rating: 4/5 – Telegraphing the limit break takes a little bit of the pressure off the opponent.